With help from the guys at Sentinel Hub, special thanks to Grega Milcinski and Marko Repse, it was possible to create this image, a 64.000 by 64.000 pixels temporal mosaic of Europe, created using the temporal abilities of the Sentinel Hub EO Browser with some post-processing in Photoshop. A click on the image will get you to a 4.000 by 4.000 pixels version, for bigger versions take a look at the download options at the bottom of this post. 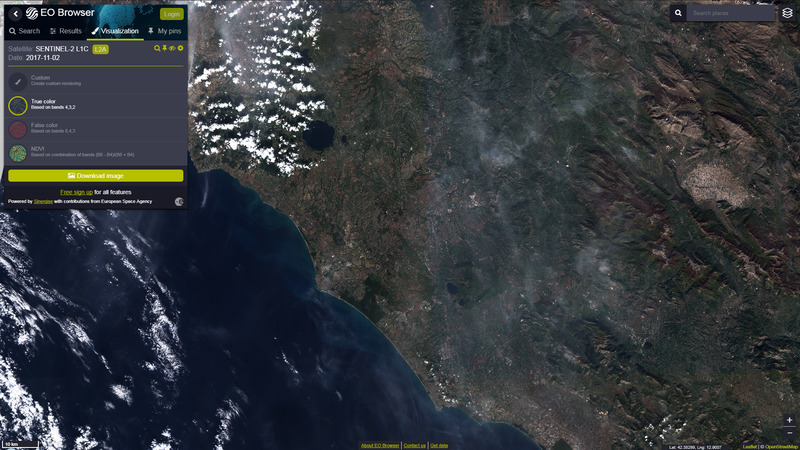 Using seven months of data from the Sentinel-2 satellites, cloud-cover could be significantly reduced for this image. You may still see some clouds, as well as shadowy artifacts in the image, being as it is, the temporal processing is still very time-consuming, so it was not -yet- possible for me to try different time-spans and tweaks of the algorithm in rapid succession. At this resolution and size I was limited to a single run with fixed settings. It does, however, already show the power of temporal processing, and with further improvements of the implementation and more speed, this ability will become a very useful addition to the EO Browser when it comes to visualizing and using Sentinel-2 data. Ground resolution in the full-size 64.000 by 64.000 pixels image is 70 meters/pixel, still far from what Sentinel-2 can deliver, so you can expect even more impressive results in the future. 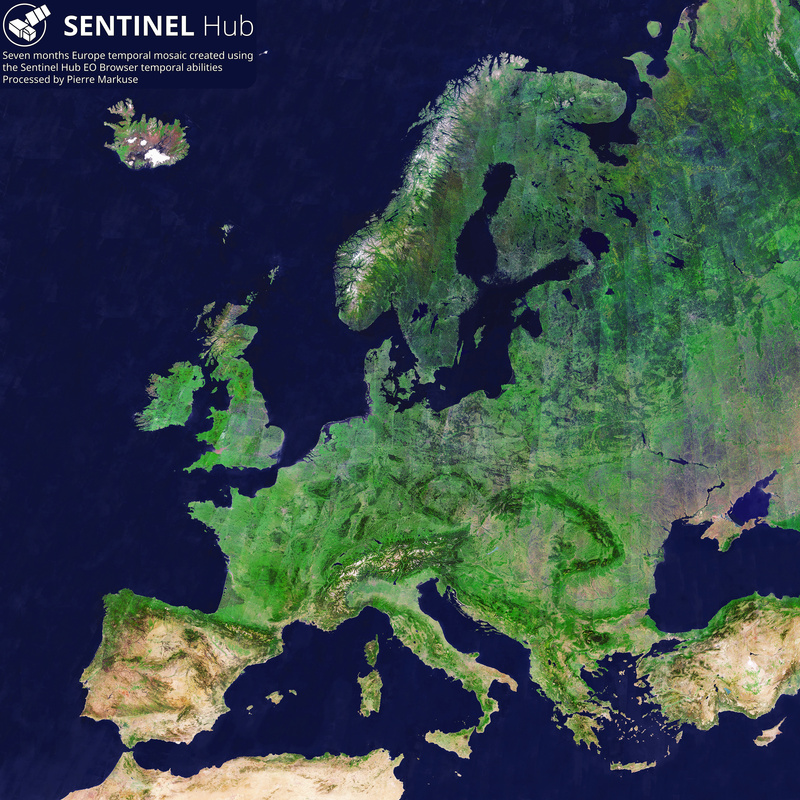 And while this Europe mosaic for itself is more an eye candy than of actual use, temporal processing at the full resolution of the Sentinel-2 satellites is way more, it is a useful tool for many scientific applications and will soon be possible for everybody within the EO Browser. Running different scripts, covering large areas and time-spans will become feasible, which will be useful for analyzing the data, as well as for rapid prototyping of scripts to develop new algorithms which can then be used with Sentinel-2 data. Take a look at this tweet showing one usage of temporal processing in agriculture. The whole thread is interesting, and make sure to also click the link in the tweet and play around. For smaller areas of interest it is already possible to run scripts for temporal processing of the data in full 10-meter resolution with a very short response time. In the future, when more and more speed will become available through improvements, these areas and time-spans covered will extend more and more. With this ease of access I’m sure that we will see a growing number of applications making use of these capabilities. For this image the post-processing in Photoshop was mostly used to make this particular image more vivid, greens are over-represented, as well as to eliminate at least some of the image artifacts. These artifacts are caused by different things, since we use data from different dates we get differences in brightness and vegetation/snow cover. Those are itself mitigated by using data from a longer time-span (seven months in this case) but are still visible. 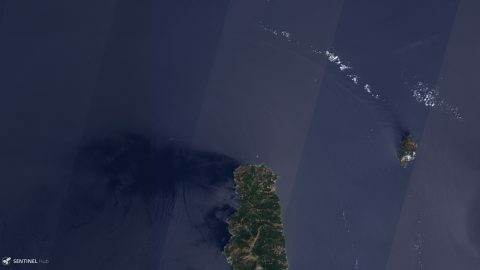 We also see some phantom shadows from clouds which itself are not visible because they are more or less filtered out by the algorithm used. In this image this is especially true in the usually more cloudy northern part of Europe. 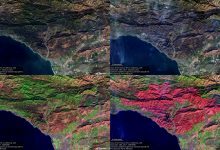 Then we have some artifacts caused by the detectors of the Sentinel-2 satellites. The striping (see image) you surely have noticed in some Sentinel-2 images is caused by viewing angle differences, odd and even detectors have a slightly different viewing angle – enough to cause the striping. Another effect causing visible striping is a spectral response non-uniformity near the detector boundaries. If you are interested in those image artifacts you can find more on them here in this PDF. In this image I used Photoshop to reduce the striping to some degree, for open water I was pretty aggressive about it and used destructive editing, so open water is more of a backdrop than actual data, although I tried to keep the data close to coastlines. For land the editing was way more subtle with some slight adjustments, staying true to the Sentinel-2 data. In the future less of this editing will be needed as it will be possible to use longer time-spans to even things out, as well as selecting different time-spans in regard to cloud-cover and overall image quality. Here on Flickr you can get a version reduced to 21.333 by 21.333 pixels as a reasonably compressed JPG of about 180MB. 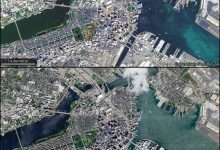 Should you want to explore the uncompressed full-size image, the Sentinel Hub is hosting a full-size Big PNG version of the image which can be downloaded here (right-click and save to your computer, don’t open in the browser). Warning: It is 6.22GB! They also offer JPGs in different sizes, 2000px, 4000px, 8000px, 16000px, and 32000px. In case you want to print the image or use it on a website I recommend downloading this 8.000 by 8.000 pixel uncompressed TIF version here, which is slightly different from the big original with some additional sharpening and more vivid colors. Just reduce the image to the size you need.